Now, if you haven’t heard of Hopper yet, you are in for a real treat (and no this is not sponsored, I really just love the app SO DANG MUCH). You can watch trips for designated times and the app will monitor pricing so that you can get the best deal! After about a month of watching, it alerted our phones one night that it had the best price from San Diego to Bangkok, which was (drumroll please!) only $330 roundtrip. That’s cheaper than a flight to New York, or a flight to the midwest, or a flight to Cancun. Yes, $330 roundtrip. Naturally, we decided to book IMMEDIATELY and convinced a total of 8 friends to go on the trip. The next morning, we took a small plane from Bangkok to Chiang Mai, which was about an hour and twenty minutes! We decided to leave for Chiang Mai immediately because we wanted to catch the famous Lantern Festival in November. It is truly such a magical time in the mountain town and there are tons of activities, music, and life happening all around during that time. Lots of people online say that the Lantern Festival doesn’t exist anymore but trust me it does and trust me you need to go. There are two festivals you can partake in: the $$$ one and the free one. The $$$ one is over $150 from what I remember… We decided on the free one, which was wonderful because you can purchase lanterns for no more than 50 cents, release them over the river running through the city, and watch the town parade. For our first day in Chiang Mai (pre-festival), we decided to explore! There is a TON of stuff to see and eat and experience. We visited temples, ate some amazing Pad See Ew street noodles, and sipped on some fresh coconut smoothies. All the food is incredible and incredibly CHEAP. You will end up spending $5-15 on food per day in Thailand. There is also mango sticky rice available at every corner which is one of my absolute FAVORITE treats. In San Diego, you get it for like $5-7 at a restaurant, in Thailand, you get it for 50 cents max. That night, we experienced the Lantern Festival. In every photo I have ever seen pre-Lantern Festival, it looks like a very tranquil serene experience where everyone meditates and then magically floats away into the sky with their lantern. I was expecting something like that, maybe yoga retreat vibes or a place where I truly channeled my inner “Eat Pray Love” epiphany. No, this did not happen. Maybe it’s because we went to the free version of the festival, maybe not. But it is absolutely CRAZY! Think of a war zone where people use lanterns as their weapons. It was amazing and terrifying and funny and I would definitely recommend seeing how alive the city becomes but definitely definitely take caution in being a part of it. We stood at the bridge overlooking the river and let ours go and we soon saw other people letting them go too early and almost catching us (and nearby trees) on fire. It’s cool though, we’re okay. Cost: Free! The day after the Lantern Festival, we went to hike into the countryside with ELEPHANTS. Now, we did a ton of research into this because it was very important to our entire group that we support an organization that rehabilitates elephants and does not promote riding them. If you are looking into riding elephants, the majority of them are abused (whipped, traumatized) in order to train them. Please do not support these organizations. Please support organizations that rehabilitate elephants who have come from these situations. We found a wonderful place called Elephant Nature Park, where you can visit their park or venture into the wild with the elephants. We chose the latter (Elephant Highlands Tour) because we wanted to see them in their most natural habitat. The tour guides picked us up from our hostel and we drove ~2 hours into the mountains. Once we arrived, we cleaned up, got a bag of fruit, and the elephants arrived! We began our ascent into the country’s lush green hills and hiked with the elephants. It was such a beautiful walk but so so special because we were walking right next to the elephants. No chains, no inhibitors. They made a buffet-style lunch for us and we then continued our hike. We arrived at a pool where we swam with the elephants and washed them. Afterwards, we made fresh food for them with brown rice and bananas. Everything about the elephant experience was magical and truly stayed in our hearts as one of our favorite experiences. I highly recommend doing this tour if you are in Chiang Mai. Cost: $176/person. The next day, we explored some more temples and hiked to a waterfall. With temples, it’s important to note that you need to cover your shoulders and thighs (especially as a woman). They will not let you in if you are dressed differently, or they will charge you for a sarong or blanket to wrap around yourself. I recommend bringing a sarong or something you can wrap as a skirt or shawl. Cost: $2-5/person (for temples), free for waterfall. The next day, we went on a Sea Tour around Phang Nga Bay. We explored various beaches and islands in a full-day boat and kayak tour. This included seeing the incredible limestone cliffs and ancient caves of Hong Island and Panak Island, swimming around Lawa Island, and visiting the iconic James Bond Island (from that one famous movie). Transportation, a buffet lunch, and equipment was all included. I really recommend doing a full-day tour like this because you get to see a variety of islands and immerse yourself in the tropical turquoise ocean. Watch out for jellyfish though, we had a couple friends get stung! Cost: $80/person. The next day, we took a ferry to Railay Beach, a place that is only accessible by boat in Krabi. Looking back, I have a lot of mixed feelings about Railay Beach. It is absolutely BEAUTIFUL and I would highly recommend, but I did have a problem with the amount of stray cats and kittens there are (who have limited access to the right care). If you are feeling up for a donation, please donate to Lanta Animal Welfare. $5 goes a long way. 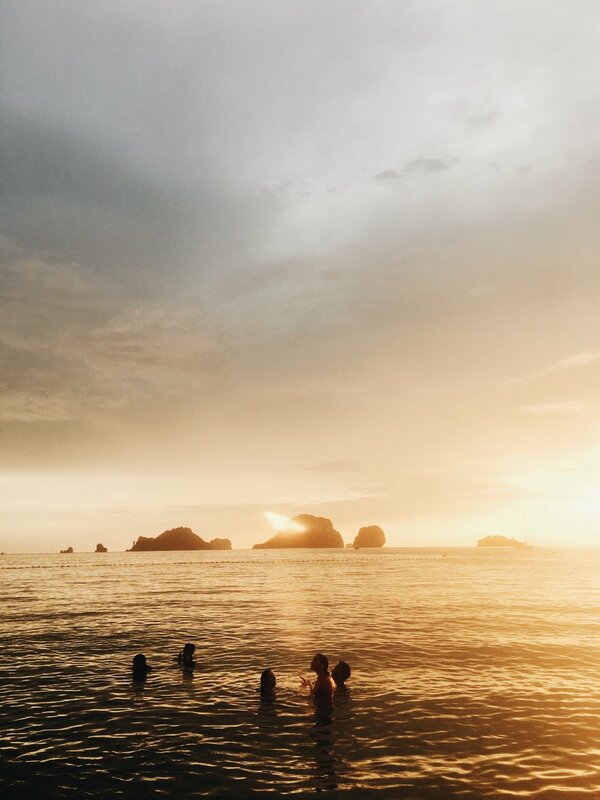 During our time there, we ate food from food boats (which are essentially like food trucks but on boats at the beach), swam in a cove during sunsets, and explored limestone caves around the secluded beach. Railay Beach was beautiful and provided so much more of an intimate experience with the Thai culture than other islands. After Railay Beach, we took a ferry to Krabi, and then a flight from Krabi back to Bangkok. We stayed in the same AirBnb hostel in Bangkok and ended our trip there. We had an amazing time exploring the variety of landscapes, from the mountains in Chiang Mai to the limestone caves in the islands to the huge huge city of Bangkok. What’s wonderful about Thailand is that once you are there, everything is incredibly affordable. Short flights range from $25-35 and can get you to the opposite side of the country in an hour! Travel + Receive $40 off your stay!